Fourth child of the Anglo-Scottish nobleman William Stewart Ferrer and his Spanish wife, Constantia Miguel; his father is reported to have had a dream in which he was told that Vincent would be a world famous Dominican friar. The boy joined the Dominicans in 1367. Received his doctorate of theology from the University of Lleida. Priest. Missionary. Taught theology. Adviser to the King of Aragon. During a severe fever in 1398, Vincent had a vision of Christ, Saint Dominic de Guzman and Saint Francis of Assisi. It was a life changing experience - Vincent received supernatural gifts and believed that he was a messenger of penance, an "angel of the apocalypse" sent to prepare humankind for the Judgement of Christ. Great preacher who converted thousands in Spain, France, Italy, Germany, the Netherlands, England, Scotland, and Ireland. Invited to preach in Muslim Granada. Counselor to Pope Benedict XIII. Travelled through Spain, France, Switzerland, and Italy, working to end the Western Schism. Slept on the floor, had the gift of tongues (he spoke only Spanish, but all listeners understood him), lived in an endless fast, celebrated Mass daily, and known as a miracle worker; reported to have brought a murdered man back to life to prove the power of Christianity to the onlookers, and he would heal people thoughout a hospital just by praying in front of it. He worked so hard to build up the Church that he became the patron of people in building trades. Orphaned at age 5. She and her sister Agnes were raised by the nuns at the convent of Mount Cornillon. Juliana read the works of Saint Augustine and Saint Bernard while she was still very young. Augustinian nun at Liege, Belgium in 1206. Worked with the sick, and in the convent's hospital. Prioress of the convent at Mount Cornillon in 1225. Received visions from Christ, who pointed out that there was no feast in honour of the Blessed Sacrament. Based on this, she promoted the additional of what became the feast of Corpus Christi. The messages she received led to being branded a visionary, and accused of mismanagement of hospital funds. An investigation by the bishop exonerrated her; she was returned to her position, and he introduced the feast of Corpus Christi in Liege in 1246. On the bishop's death in 1248, Juliana was driven from Mount Cornillon. 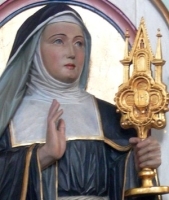 Nun at the Cistercian house at Salzinnes until it was burned by Henry II of Luxembourg. Anchoress at Fosses. Friend of Blessed Eva of Liege, who worked for the acceptance of the new feast. The office for the feast was later written by Saint Thomas Aquinas, and was sanctioned for the whole Church by Pope Urban IV in 1264. The feast became mandatory in the Roman Church in 1312. Orphan who lived an unhappy childhood in the home of her paternal uncle. Felt a call to the religious life at age 15, but her confessor convinced her to wait a little. Domestic servant in Palma, Spain where she learned to read and write. Joined the Canonesses of Saint Augustine at Saint Mary Magdalen convent in Palma. Subjected to many strange phenomena and mystical experiences including visits from angels, Saint Anthony of Padua and Saint Catherine of Siena. Had the gifts of visions and prophecy. Assaulted spiritually and physically by dark powers, she sometimes went into ecstatic trances for days at a time; her wounds from this abuse were treated by Saint Cosmas and Saint Damian. During her last years she was almost continually in ecstasy. Foretold the date of her death. One of eight children born to Martina and Manuel de la Mata Aparicio. Studied in Valladolid, Spain. Joined the Augustinians on 9 September 1921, taking his solemn vows on 23 January 1927. Studied in Pisuerga, Spain and then at the monastery of Saint Maria La Vid in Burgos, Spain. Ordained on 25 July 1930. Taught at the College La Encarnación in Llanes, Spain. Missionary to Brazil in July 1931. He became known as the messenger of charity to the poorest of the poor. Teacher and coordinator of teaching throughout the missionary region. Seventh of the eight children of Matthias Höss and Lucia Hoermann. Franciscan tertiary nun in 1703, admitted to the convent at Kaufbeuren, Germany at the request of the town's Protestant mayor. Mistreated by her new sisters for her lack of a dowry, her holiness overcame their hostility, and she won them all over. Porter. Novice-mistress from 1726 to 1741. Reluctant superior of her house from 1741 until her death in 1744. Born a prince, the son of King Hywel Mawr; grandson of Hoel I Mawr the Great. Brother of Saint Tudwal. Brother of Saint Arthfael. Soldier whose skill was celebrated the bards of his day; he fought in the battle of Camlan in 537. A life at war caused him to turn to religion. Hermit and then monk at Llantwit, Wales. Abbot of Ynys Enlli. Missionary. A wooden statue of Derfel on horseback was a great treasure of the church at Llanderfel; it was used in the pyre that burned Blessed John Forest. Sister of Saint Agape and Saint Chionia. Convicted of possessing the Scriptures despite a prohibition issued in 303 by Emperor Diocletian, and of refusing food that had been offered to the gods. Following the martyrdom of her sisters, Irene was also ordered to deny the faith; she refused. She was sent to a house of prostitution, and when she was unmolested after being exposed naked and chained, she was executed. Martyr. Educated at the monastery of Corbie, France. Benedictine monk at Corbie. Cellarer. Travelled with his abbot to Monte Cassino and Rome. Ordained by Pope Saint Leo IX. Suffered from severe headaches; when he returned to the monastery at Corbie, he was cured of them by Saint Adalard. Made a pilgrimage to Palestine. Abbot of Saint Vicent's abbey, Laon, France. Abbot of Saint Medard abbey at Soissons, France; he was expelled from Saint Medard's by a usurper for the position of abbot. Founded the abbey of Sauve-Majeure which spread a devotion to the Benedictine Rule. Franciscan friar. Missionary preacher in Ircania, an area near the Caspian Sea, a region of primarily of Muslims and Eastern Orthodox Christians. One day as he was preparing to preach the faith in public, he was set on and murdered by a mob. Martyr. Taken to Pietra Montecorvino in Apulia, Italy as a child. Bishop. He became blind in later years, but was known to his visions, and as a miracle worker. 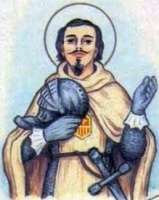 Mercedarian secular knight, receiving the habit from Saint Peter Nolasco himself on 10 August 1218, the day of the founding of the Mercedarians. Became a monk at age 30. Captured, tortured and martyred in Mesopotamia. Fourteenth century Dominican. Spiritual student of Saint Vincent Ferrer. Noted and passionate preacher. Mercedarian friar. Pious and enthusiastic archbishop of Athens, Greece. Fourteenth century Dominican. Spiritual student of Saint Vincent Ferrer. Sister of Saint Simeon. Widow. Martyred in the persecutions of King Sapur II. Dominican. 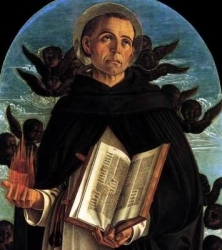 Travelled and worked with Saint Vincent Ferrer. Five young Christian women martyred together for their faith. We don't even know their names. Large group of Christians murdered while celebrating Easter Mass during the persecutions of Genseric, the Arian king of the Vandals. One-hundred and eleven (111) men and nine (9) women who, because they were Christians, were dragged to Seleucia and martyred for refusing to worship the sun or fire or other pagan idols during the persecutions of King Shapur II.